This pewter bracelet features a diamond cut dragon. It contains biomagnetic magnets, which have provided relief for some arthritis sufferers. 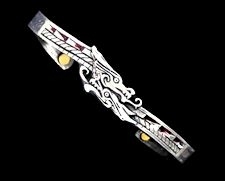 This dragon bracelet measures 2 3/4" across from side to side and can be adjusted slightly. The bracelet is approximately 1/2" wide at the widest point and tapers to 1/4" at the back. Magnets have been used for thousands of years for natural healing. It is thought that they help to stimulate circulation. A spokesman for the Arthritis Research Campaign said: "Results appear to show that biomagnetic bracelets do reduce pain in people with hip and knee osteoarthritis although it is still unclear how. As they are quite cheap and safe, people with osteoarthritis might want to consider wearing them as part of their self-help regime.'" This bracelet should be worn in addition to your regular arthritis treatment, and is not intended to replace other medical care.